What Makes a Card PPV Worthy? What makes a card pay-per-view worthy? It’s a good question and whilst there’s a general consensus on the criteria it’s still relatively subjective – it needs a top-class headlining fight, that’s a fact, and a cracking undercard but aside from that it’s a relative free for all. Of course living in the UK we have it relatively easy in comparison to our friends over in America who frequently pay upwards of $70 for a PPV so the £19.95 we are asked to cough up by Sky (or £16.95 for BoxNation / £9.95-£16.95 for ITV Box Office) seems almost spare change. But that’s not really the point, there’s still very much a live debate as to the future of PPV in the United Kingdom and I’m going to kick off with a fight you couldn’t exactly call “legit” despite the word being hammered down your throat if ever you were to scroll through the two competitor’s social media – KSI and Logan Paul will compete for the “YouTube Boxing Championship” in a glorified white-collar match at the Manchester Arena. A Mayweather-McGregor-esque first press conference witnessed theatrics a plenty with both “boxers” doing their best to get under the skin of one another in a display that was, in parts, comical and, in parts, genuinely tense – no less than when KSI made reference to Logan Paul’s infamous suicide video. Of course this attracts a different audience to those that will watch boxing on subscription channels such as Sky or BT and is, undeniably, targeted at a younger, more impressionable demographic but it’s just a nice place to get started when examining the British PPV scene. Whyte-Parker is another card to examine with the headlining fight being a genuine 50-50 and one that certainly ticks the box of “fight that couldn’t be made without PPV revenue” but with no major title on the line nor the fight being an eliminator contest – despite Whyte being offered two – it’s certainly towards the weaker end of the PPV spectrum. Taking that into account, then, you’d expect an even better undercard to try and off-set the slightly weaker, albeit enjoyable, headlining act and, despite the card being beset with injuries and withdrawals from the offing, you can’t really say it delivered – Katie Taylor fights an inactive opponent with her next fight already announced, Dereck Chisora and Carlos Takam fight in a barnstormer yet, overall, inconsequential fight and Connor Benn and Cedrick Peynaud rematch in a fight which is only marginally interesting because last time round Benn was worse than expected and Peynaud better than expected. The question, then, to be asked is why is this capable of being marketed at PPV when the card is, in all honesty, a slightly beefed up Saturday fight night? It’s a simple answer and it’s not necessarily something that is particularly surprising but people will buy the card – which isn’t meant to be a dig at people who will buy it – and the promoter and broadcaster know that. Sure, this won’t do Anthony Joshua numbers but it will still pull in 200-250,000 purchases and, on the conservative side, near an extra £4million in revenue. From that side of things it’s a no-brainer to make it a PPV because it just means more profit (although, of course, that money goes primarily to the fighters). Many people will, and do, feel hard done by PPV shows when they feel they aren’t worth the asking price and that comes down to the fact that to access boxing on British TV you already have to subscribe to both Sky and BT which comes in the hefty price of £815.88 a year so when the argument of “if you don’t like it, don’t buy it” comes into play then HOLD ON, we’re already paying nearly a grand a year and what we’re saying is the saturation of quality for an increase in subscription costs. The outrage, therefore, is somewhat understandable. And this feeling then seeps into other offerings such as the World Boxing Super Series final between Usyk and Gassiev which are sensational fights and worthy of PPV BUT had me getting outraged in the early stages of the build-up at the prospect of having to pay a mere £9.95 for the pleasure of watching it. My reasoning for getting worked up about it? Benn-Peynaud II! It makes no sense but it all comes full circle because here I am, a full-time student, working a 30 hour job on top of that all while trying to get started in this boxing industry and, to be frank, I haven’t got that much money to spare. I hear people saying “why don’t you just stream it?”, streams are so unreliable and I’ve not had a lot of luck so the prospect of Benn-Peynaud being justified as PPV worthy ended up getting me irritated about Usyk-Gassiev and no it doesn’t make sense but it is what it is. And OF COURSE, no-one is making you pay for anything and this isn’t an article looking to attack pay per view, not in the slightest, that was just the negative section of this piece. There are, in turn, huge positives that can come out of pay per views cards, when done properly so a few bad examples don’t mean the format is a write off as a whole and, indeed, the revenue created via a PPV card has enabled some fights to be made that, otherwise, wouldn’t be financially feasible. 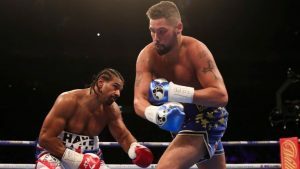 If we look at Haye-Bellew / Bellew-Haye II then they are two of the most publically demanded fights in recent memory filled with genuinely bad blood and whilst there was no title on the line and the fights weren’t the most aesthetically pleasing, the spectacle, the story, the drama, well it easily justified the price tag in my opinion based on the fact it was a wanted fight and only viable through the revenue of a pay per view. Anthony Joshua vs Deontay Wilder, when or if that is made, will be a fight that you’d assume would be unable to be criticised for being on PPV but, as always happens with Joshua, there will be people incredibly vocal in their belief that they should be able to see the best of the best without paying extra BUT that for me raises a whole other point. The point being Anthony Joshua, arguably, is the only real PPV fighter in the United Kingdom because his name alone is capable of selling an 80,000 capacity Wembley Stadium, regardless of opponent, and such is his attraction that you could put him in with a grizzly bear and it would sell upwards of one million buys (although, actually, that would be quite an interesting fight). And my final point – entertainment. £19.95 for six, seven hours of entertainment on a Saturday evening, an opportunity for a social gathering, is bloody good value and certainly cheaper than taking my girlfriend to Nandos. Anyway I’m going off on a ramble and I’m nearing 1,200 words so to conclude on PPV (in a very inconclusive fashion) – 1) too many PPV cards are saturating the quality of non-PPV cards 2) it doesn’t matter as long as people keep buying it 3) most PPV cards are good value for money for an evening’s entertainments. Hey, I guess it’s a price you have to pay for being a boxing fan!